When looking back on the 20th Century, people generally think of World War II as the most significant conflict of our time. And while this is not under much debate, it has greatly overshadowed another conflict that still has repercussions to this day. That conflict was World War I. It was a war unlike any other, a slaughter that was on a scale unimaginable to this day. The conflict had eradicated an entire generation of European men and devastated the land for decades. At the beginning of the 20th Century, the world was in a period of prosperity. Military alliances began to stretch across the globe as the empires of Europe vied with each other for power. Britain, France, Germany, Austria-Hungary and Russia all helped to spark the fire for a war that would end all. The United States at this time was also expanding into a new world. The frontier of the old west was gone, and new lands lay beyond the borders of our country. Especially in Asia, where China was a theatre for much of the military action for both the United Sates and Europe in the beginning of the 20th Century. Then, an incident in the city of Sarajevo changed the world forever. The assassination of Archduke Ferdinand and his wife Sophie touched off hostilities between Serbia and Austria-Hungary. Each one was throwing accusations at the other trying to place blame for the incident. Then Russia got involved on the side of Serbia, and Germany came in to Austria-Hungary's corner. Things thus began to spin out of control as more an more countries began to be drawn into the fray. In the afternoon of August 4th, 1914, before anyone really knew what was happening, the first German soldier crossed into Belgium. By the beginning of 1918, both the Allied and German powers were on their last mile of endurance. When Russia fell into a revolution, Germany was freed from the strain of a two front war. The German High Commander, Erich Ludendorff, shifted the relieved forces to the Western Front. Germany now had some thirty-five divisions poised for one grand offensive pointed toward Paris. Using new tactics, and the experience afforded to veterans of a long war, the German Army made massive gains that had not been achieved since 1914. The French Armies were now in full retreat across the Allied lines and headed toward Paris and away from the German juggernaut. The only thing that stood in Germany's way was the American Expeditionary Forces at Belleau Wood. The German advanced was checked by the Marines and soldiers at Belleau Wood, allowing time for the French forces to reform. The Americans sounded the bugle call that would bring the French Army back on its feet. During the summer of 1918, the Allies were back on their game as the French and British Forces quickly patched up their wounds and remade a new line that was now getting dangerously close to Paris. The first order of business was to snub out the St. Mihiel salient that was poking out like an angry thorn into the side of the Allied line. This fell squarely into the Americans sandbox as they went into their first real front line action. By September of 1918, the Allied line finally regained some of its territory that it had lost to the German advance earlier in the year. Though the Allies didn't know it, Germany was now in the corner. Everything was much the same as it was a year ago, with one vital exception. There was a whole new Army on the southern flank of the Western Front. The American 1st Army was under General Pershing and now the Allies felt it was time to make good on its new numerical superiority. Using several ruses to deceive the Germans into thinking the offensive would head toward Metz in the north, the US 1st Army began to form in the area between the Meuse River and the Argonne Forest. At 5:30 on the afternoon of September 26th, the American 1st Army jumped off with the French holding their flanks. Following a rolling barrage of artillery fire, the US 1st Army crashed through the German defences. The US 3rd Corps pushed its way into the Germans second defensive line but the 5th Corps got stopped at Montfaucon during the first day. The Germans rushed six divisions into the line to try to plug the hold. By the end of the day, the US Army had not gotten very far, but in the overall theatre of war, it didn't need to. Up in the north, the British Armies under General Plumer were now beginning their own push into German territory. Due to the deteriorating situation that the Americans had produced, they had recaptured the Passchendaele Ridge which they so bloodily lost the year before. To Erich Ludendorff, the situation was turning from bad to worse. He now found himself trying to plug all the holes in the line and with no forces left to plug them with. By October 6th, three British Armies smashed their way to the Hindenburg line, the last German line of defence, but they were to spent to make past it. At around the same time, General Pershing took his most veteran divisions and squeezed out Montfaucon and tried to restart the offensive. General Pershing now had to get through the Argonne forest to get to the breakout which the Allies wanted and needed. However, the Germans threw a brick wall in the way of the American advance in the Argonne Forest. The 77th Division took a heavy toll in the Argonne Forest and now the Germans threw everything they had left into holding the US 1st Army back. The 28th Division was having a better day and instead went down the Aire Valley and captured Varennes. The Germans had nothing left in reserve now to strengthen the line, and now the Allies were putting more and more pressure into the battle. Feeling instead of knowing that this time, the end was near. Time was now working on the side of the Allies, for every day the Germans tried to hold their line, more and more Allied Divisions were going into the fray. Erich Ludendorff, now reported to the Kaiser that it was now lost and to sue for peace. The British Armies, now backed by the French were banging on the front door and the Americans were about to crash through the back door. By the beginning of November, the American 1st Army was still blocked by the Argonne Forest which was being held staunchly by the Germans, even though everywhere else the line was finally buckling to the Allied onslaught. At 11:00 AM on November 11th, the battle ended with the signing of the cease fire and the Armistice. The US 1st Army by that point had bludgeoned its way around the Argonne Forest and made its way to the Hindenburg line and was about to open another operation toward Metz. What was the effect of the US involvement during this campaign? Well, it was drawn down to simple numbers and the fact that the Germans couldn't be everywhere at once. The Americans began the first of several advances that first pushed back, then broke the German line in the Western front. What the Allies were trying to achieve in over four years of brutal trench warfare, the Americans had done in only two months. The American Army had become the anvil to the Allied hammer blow in the Western Front. 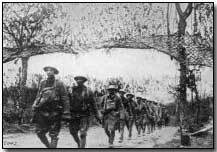 By the end of the Meuse-Argonne offensive, there were 1.3 millions American troops on French soil that were in the front or heading to it. The signing of the Treaty of Versailles was the beginning of another chapter of world history. A chapter of irony, blood and sorrow. A chapter of paths forgotten, and the price of treading down such paths. Paths, made of fire.